Skype Free Group Video calls To 10 people : Chat with Multiple Friends | Free Pc to Phone Calls, Free Voip Calls to India International ! We all enjoy chatting with our friends and free voice calls to them is always very enjoyable. But what's interesting is video chat with your loved ones (and yes free). Actually what's more interesting and highly enjoying is video chatting with multiple people at same time. In more technical words, we are talking about video conferencing or group video calls. Good news is that you can now use Skype to make group video calls with up to 10 people - letting you bring even more of your family, friends or business together, even if you’re cities or continents apart. Note that everyone in a group video call now needs to be running the updated version of Skype (so that everyone has capability of group video chat). So if your friends, family or colleagues are using Beta 1, they’ll have to upgrade before you can include them in group video calls. Skype has also changed its user interface. It looks more sleeker, neater and crisper than before. Skype Home, has been added where you can follow your contacts' mood messages, set your profile picture and mood message, receive account notifications and learn more about using Skype. - You can chat with maximum of 10 people at same time. - It’s great for regular family catch ups or to hold business meetings with anyone worldwide. - To use group video calls, at least one person on the call will need to have a Premium account. You can try Skype for free for whole one month. This free month included unlimited calls plan, group video calls and even group screen sharing. - To avail this free trial you need to purchase a plan (which you can cancel before your free month completes). And if you love using these great Skype features you can keep them after the free trial for just €7.992 a month (that's more than 50% off the regular price). To make this easy for you Skype will need your payment details to start your free trial. You’ll not need to do anything to keep the subscription – it’ll automatically renew each month. Not sure? No problem. Simply cancel any time within the first 27 days of your free trial. - You can make group video calls from your windows laptop/desktop : Check out this tutorial which I found on Skype website. Similar tutorial exists for Mac PC as well. 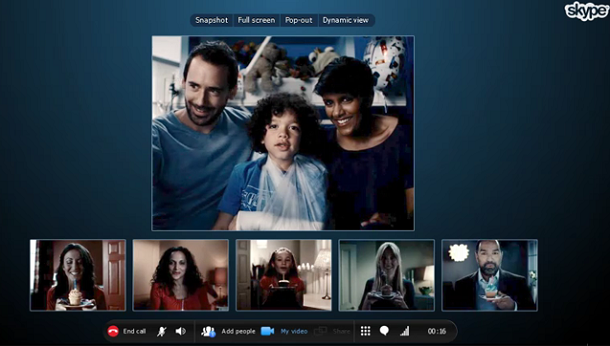 Only one group video call can take place on the same computer at the same time. If you are signed in to Skype on more than one computer, you can participate in one group video call on each computer you are signed in to. Please note that Group Video Calling is not available on mobile devices application (like android, iPhone) and Skype tablet applications. I would suggest you to hook up your laptop with your televison to enjoy video calling on TV. And couple this with group video calling as described in this post. Group Video Chat on television will be a totally different experience at home.